In today’s business climate, accounting and finance job seekers relatively have more career opportunities than other professions. 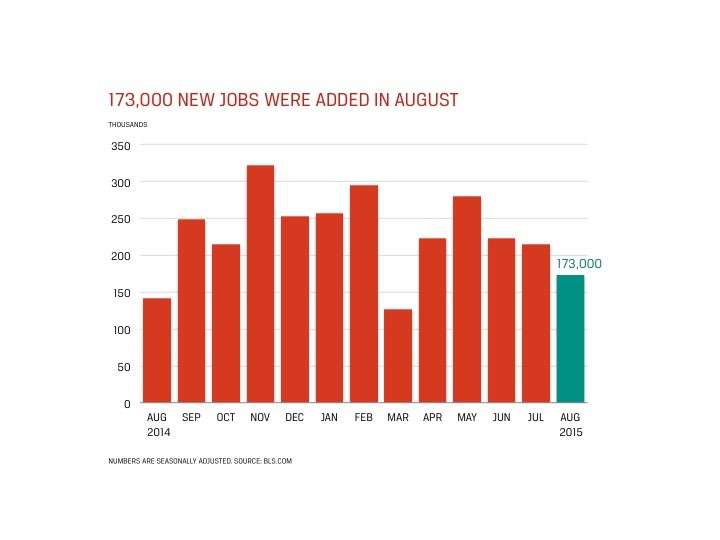 On Sept. 4, BLS announced that the U.S. economy created a weaker-than-expected 173,000 jobs for the month of August. Economists had expected a 220,000 increase in new jobs, which is more in line with monthly job creation numbers since the start of summer. On Sept. 4, the Dow Jones Industrial Average fell 272.38 points, or 1.7 percent, as investors remain concerned on the state of the U.S. economy amid a seeming global slowdown. The official unemployment rate dipped to 5.1 percent from 5.3 percent in July, but a record 94 million Americans did not participate in the labor force in August—261,000 more than July. A 5 percent rate of unempployment suggests an economy that may be at risk of overheating, which may result in higher inflation. However, the labor force participation rate remains at 62.6 percent, a 38-year low. Historically, the Department of Labor has tended to revise August’s job numbers and may do so in a few weeks. If BLS follows such a course of action, the government may provide a more optimistic revision. August’s employment data tend to be affected by employers laying off end of summer jobs. Also, relatively few businesses participated in the government’s monthly survey.